BANGKOK, May 15 2013 (IPS) - At first glance, the poster appears to be a typical advertisement for an African safari: a large rhinoceros set against a rugged, open terrain. Then you take a closer look and realise something is amiss. Produced jointly by the wildlife watchdogs TRAFFIC and the World Wildlife Fund (WWF), these posters are soon to appear on the walls of public places in major Vietnamese cities including the capital, Hanoi, and Ho Chi Minh City. Offices, apartment buildings and even airports are all set to become sites in the campaign to end the illegal international trade in rhino horns that is threatening the ungulate to extinction. Experts say there is no better place than this Southeast Asian nation of 87 million to drive this stark message home. Vietnam has long been singled out by international groups monitoring the illicit wildlife trade for the dramatic rise in domestic demand for African rhino horns. Close to 290 of the 20,000 rhinos left in South Africa have been killed for their horns since the beginning of this year, according to conservationists worried that such a deadly spree could see the death toll match the record number of 668 rhinos killed by poachers in 2012. “We are in the midst of a rhino poaching crisis,” Mark Jones, a British veterinarian who heads the London-based Humane Society International, told IPS, adding that Vietnam has recently emerged as the main market for rhino horns. The spike in demand has been shaped by a belief among locals that has taken root over the past five years: that rhino horn has special medicinal powers, including the ability to treat cancer, cure hangovers, and act as an aphrodisiac. According to Naomi Doak, coordinator of the Greater Mekong Programme at TRAFFIC, the graphics for the new campaign poster were developed after experts realised that a “large proportion of the Vietnamese public” were not aware that rhino horn, a mass of agglutinated hair, is comprised of keratin, the same basic substance that constitutes human finger and toenails. To understand what wildlife protection groups are up against, one need only take a stroll through Hanoi’s famed Old Quarter, a colourful network of 36 streets where crafts and local products have been hawked for centuries. Here, shops specialising in traditional Chinese medicine (TCM) attract scores of customers seeking remedies made from wild animal parts, including rhino horn. In his latest documentary ‘Bad Medicine – Illegal Trade in Rhinoceros Horns’, conservationist and filmmaker Karl Amman traces the routes of illegal traffickers from the Africans wilds to the streets of Vietnam, where “rhino horns have also become a status symbol,” he said. This explains why gold, once the favourite gift among the communist-ruled country’s expanding class of wealthy citizens, has been dethroned by rhino horns, which currently fetch 65,000 dollars per kilogramme. This is “more than gold, gram for gram,” according to Jones. Though the weight of rhino horns vary, an individual horn can fetch upto 150,000 dollars. The pressure on Vietnam to curb the demand for illegal rhino horns is expected to grow following the resolutions passed in March at the Bangkok meeting of the Convention on International Trade in Endangered Species (CITES). The strong language at this 16th global gathering of 178 member countries fell just short of imposing sanctions on Hanoi. The Vietnamese government, meanwhile, has consistently denied allegations that it is a major market in this global trade. It often points an accusing finger at its powerful northern neighbour, China, which is also under scrutiny for boosting the illegal wildlife trade, particularly the demand for tiger parts. But activists have proof, and are not prepared to remain silent. Do Quang Tung, deputy director of CITES Vietnam, who headed his country’s delegation to the Bangkok talks, told a Vietnamese newspaper in late March, “From 2004 until now, 13 (individuals) involved in rhino trafficking were arrested, with a total of 150 kg of rhino horns.” Two of these cases, he said, occurred in early 2013. “Illegal trade in rhino horns involves highly organised, mobile and well-financed criminal groups, mainly composed of Asian nationals based in Africa,” a report published by TRAFFIC and the International Union for Conservation of Nature (IUCN) revealed early this year. 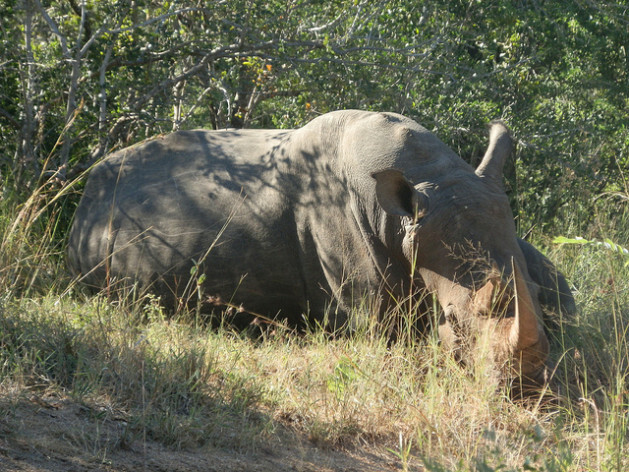 “These networks have recruited pseudo-hunters including Vietnamese citizens, Thai prostitutes and proxy hunters from the Czech Republic and Poland to obtain rhino horns in South Africa,” added the report. Another embarrassment for Vietnam has been scandals involving its diplomats at the South African mission who were accused of smuggling rhino horns in 2006 and 2008. When confronted about these incidents at the recent CITES meeting in Bangkok, a Vietnamese government official said that the errant diplomats had received “punishment” for their actions. Hopes are running high that the impending poster campaign will do its part to educate the public and bring an end to the thriving trade. But it will take more than two animal rights groups to halt rising demand.